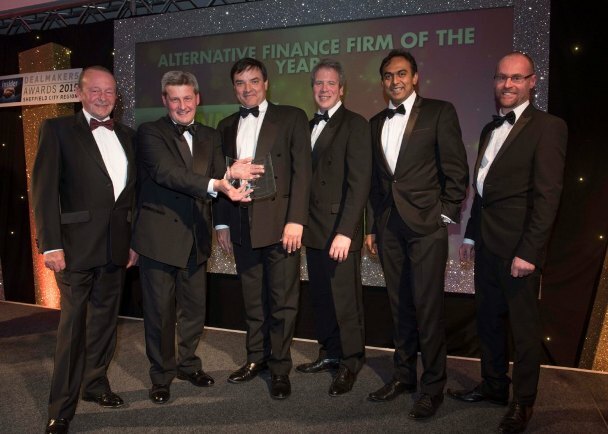 Finance Yorkshire triumphed at the Sheffield City Region Dealmakers Awards 2015, taking the title of Alternative Finance Firm of the Year. The Dealmakers awards is the region’s biggest event for accountants, lawyers and business investors. The black-tie event at the at the Mercure St Paul’s Hotel, Sheffield, was attended by more than 200 leading business figures. It was hosted by Martin Bayfield, former England rugby union player. Gavin Frost of R&B Group presented Alex McWhirter, chief executive of Finance Yorkshire, with the Alternative Finance Firm of the Year Award. Alex said: “Having invested a milestone £90m at the end of 2014, the Dealmakers Award is superb recognition for Finance Yorkshire. We completed 145 deals in Yorkshire and Humber in the last year worth some £21.2 million, investing at a time when the market for finance still presents some challenges. “As a result, Finance Yorkshire has become a respected and key player in the investment community across Yorkshire.